Kliknij na zdjęcie i przejrzyj wszystkie dostępne zdjęcia do Pousada Fazenda das Bicas. jazda konna, całodobowa recepcja, biuro informacji turystycznej, wspólny salon / sala TV. Featuring horseback riding activities, free breakfast buffet and a 24-hour front desk, Pousada Fazenda das Bicas is 1 km away from waterfalls and a 15-minute drive from Parque Arqueologico da Serra de Santo Antonio Archaeological Park. The rustic-style rooms with wood floors offer a wardrobe and access to a shared bathrooms. Linens and towels are provided. A shared TV room is available for guest use. 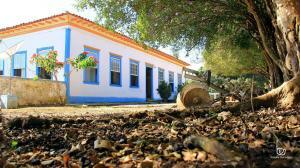 Pousada Fazenda das Bicas is 12 km from Andrelândia city centre. São Vicente de Minas city centre, where the historical site Estrada Real can be found, is a 10-minute drive away. São João del Rei Airport is at a distance of 100 km.